We'll be welcoming Holy Week earlier this year because it's happening on the first week of April (April 2 to 5). 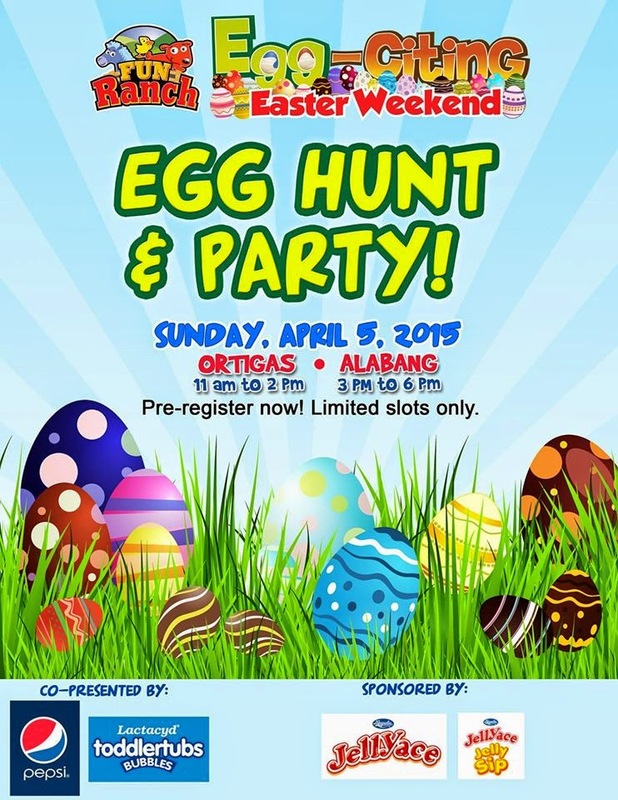 Due to readers and supporters who refer to my blog for events list for the children, I am compiling the 2015 Easter Egg Hunting Events in Metro Manila already. 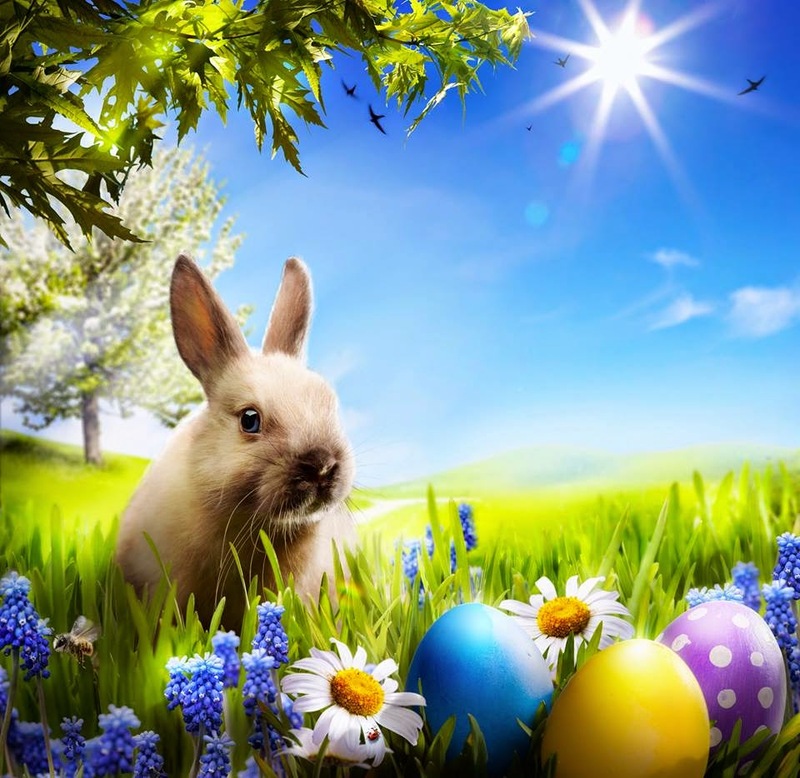 But before Easter Sunday, I do hope that we all observe the holiness of the long holiday and in remembrance of the Passion of Christ. To Catholics, like my family, we regularly do our Visita Iglesia in Manila or Quezon City churches on Maundy Thursday and attend other church ceremonies and activities in observance of the Holy Week. 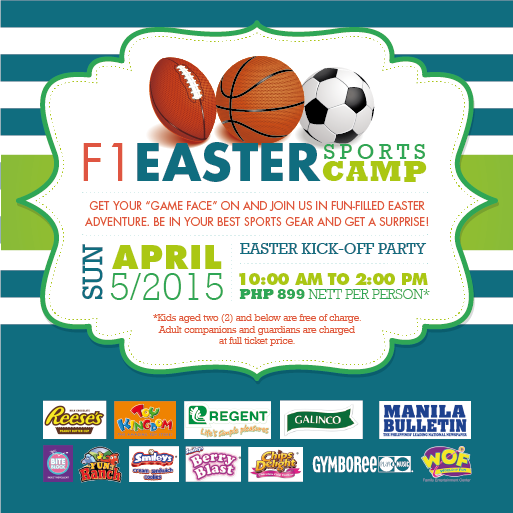 Fee: Free, registration is needed to be done from 10 am to 12 noon. 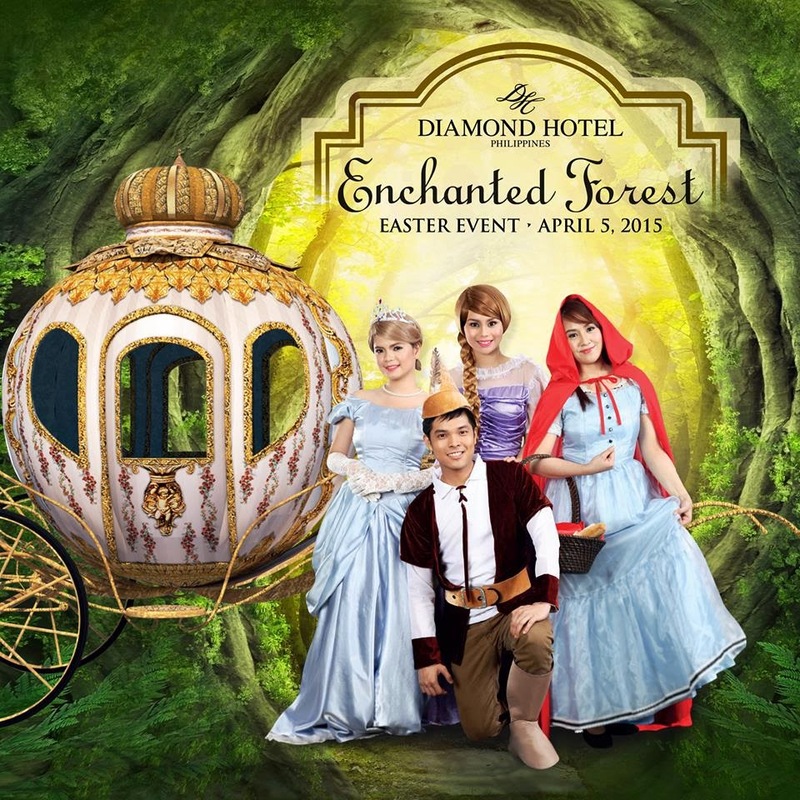 What: Storybook Parade, Giant Easter Egg Exhibit, Candy Buffet, and Easter Egg Painting and more. 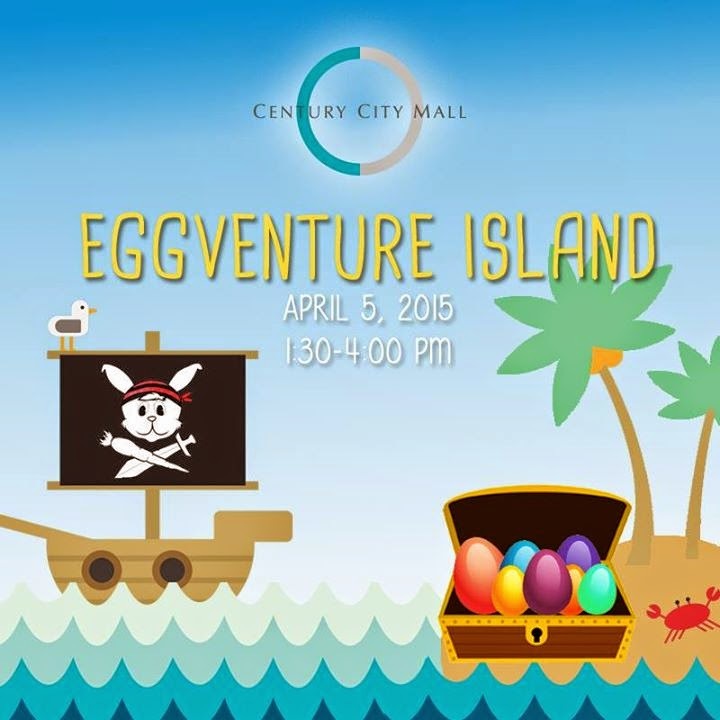 What: EGGVENTURE ISLAND - Easter Egg Hunting, balloon ship, magic show, meet high-seas characters, and free candy treasure. Register at the mall concierge desk. 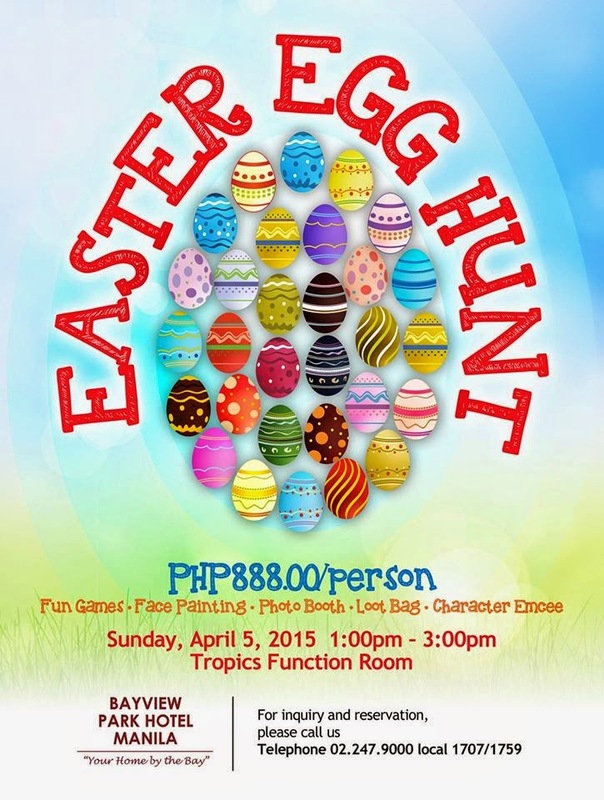 Entrance is P300 per child. 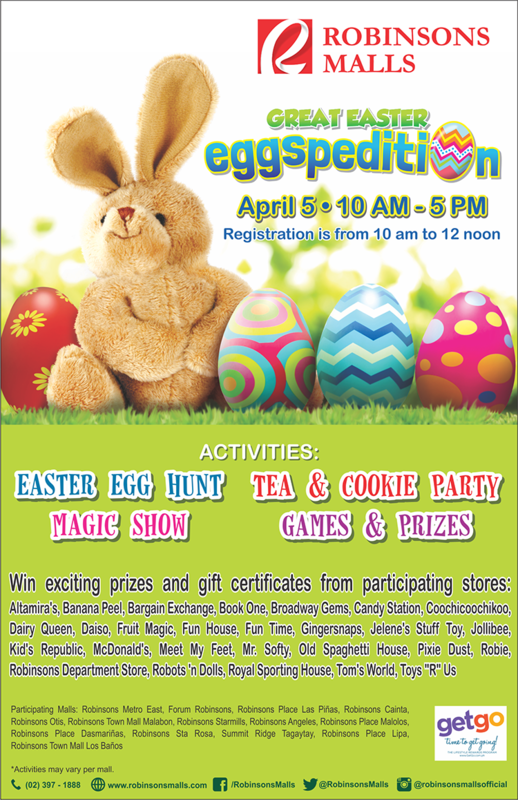 Early registrants (March 16-27) have a chance to win grand special prizes, including an iPad Mini! 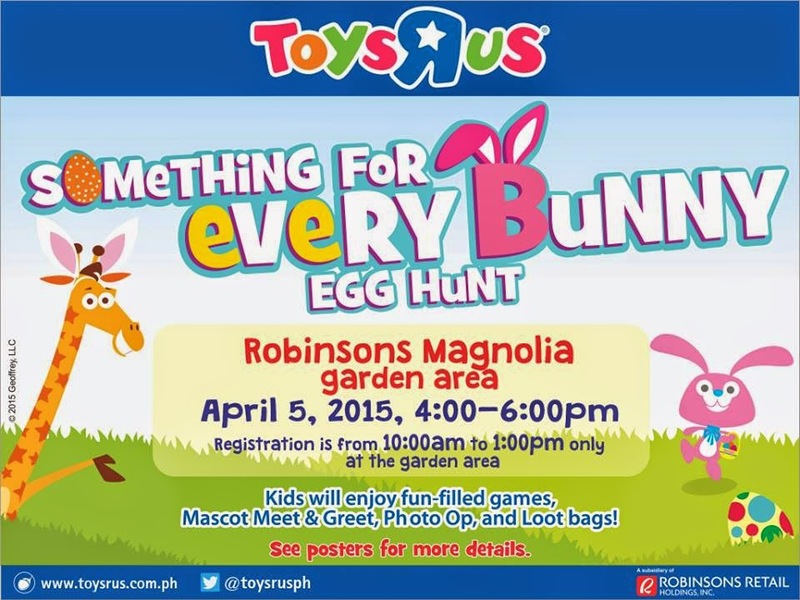 Fee: Spend at least 1,000 worth of merchandise at participating Toys R Us stores to get an entry pass. Open to kids 4- 10 years of age. For more information, visit their WEBSITE or like them on FACEBOOK. 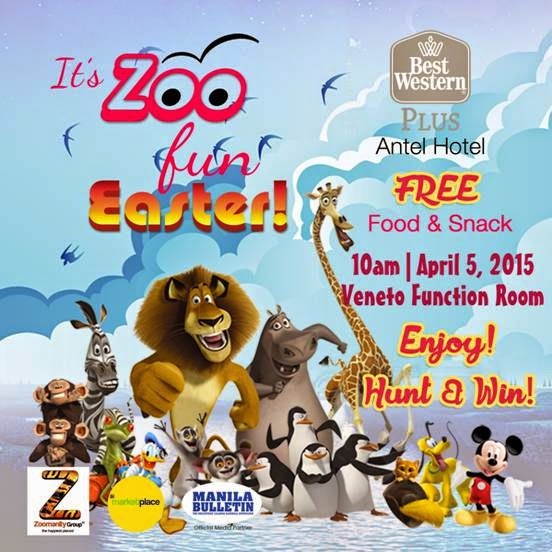 Fee: Php 899.00 per child, two (2) tears and below are free, Adult companion to also pay full charge. 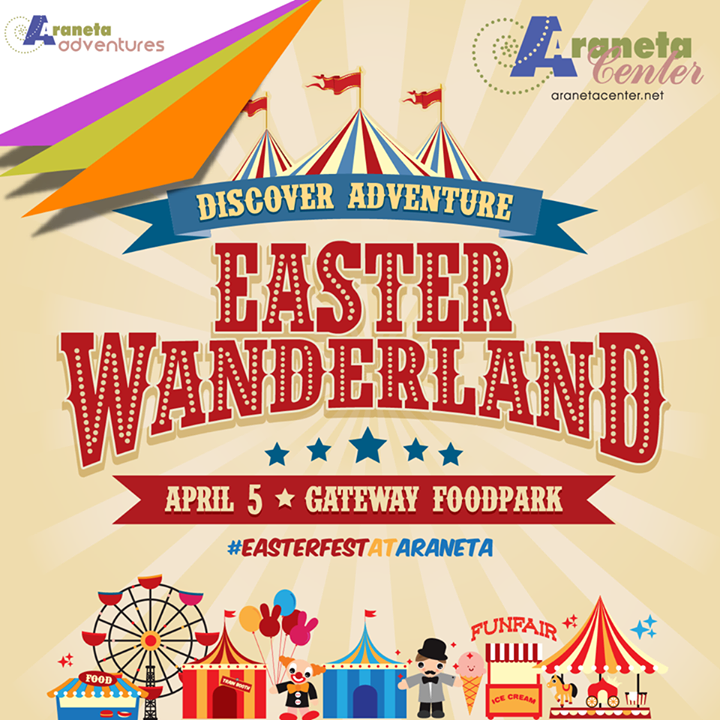 What: Ride-All-You-Can wristband (Unlimited Play if Alabang), snacks, food cart treats, loot bags, access to all side activities and egg hunt. 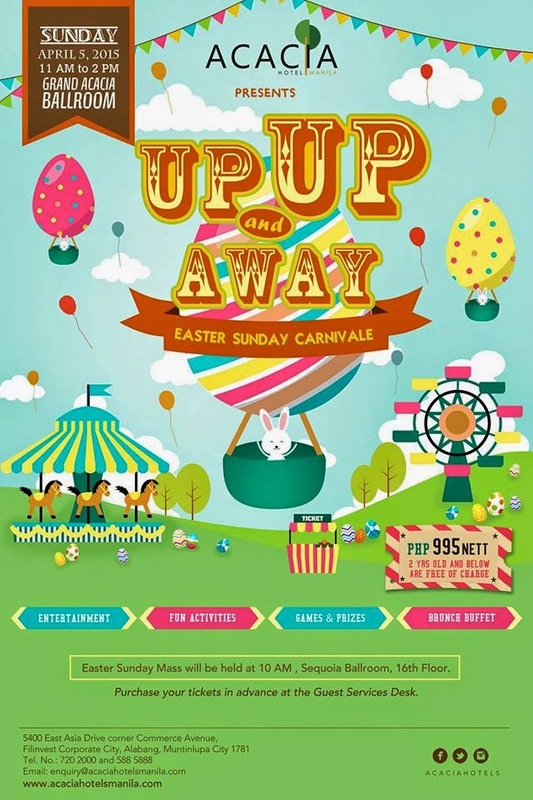 Php275/adult inclusive of entrance to the event, snacks, food cart treats and access to all side activities. No ticket, no entry. Buy your tickets now, limited slots only. 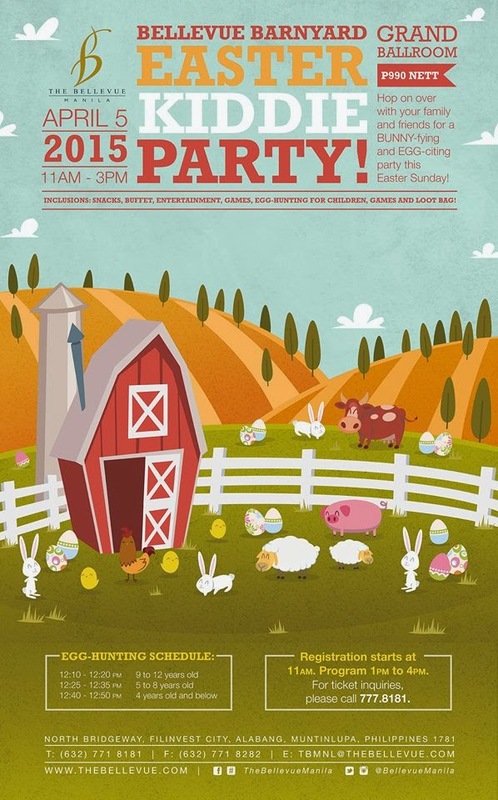 For more details, call 706-3029 or 31 or like them on FACEBOOK. For more information, contact them at +63 2 887 2888 Ext 6694, visit their website here, here or here and like them on FACEBOOK. 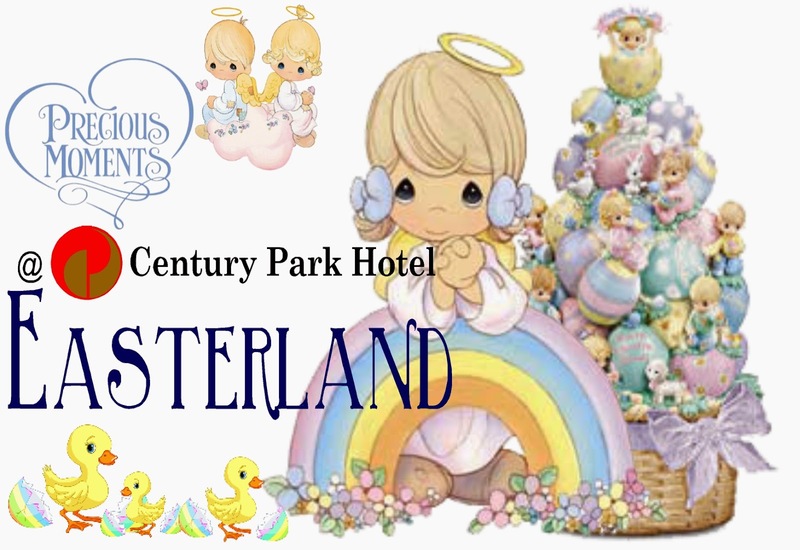 What: Face & Egg painting, Musical Entertainment, Mime Show, Kids’ Salon, Cupcake Decorating, Photo Booth, Games, Glimmer Tattoo, Loot Bags, and Magic Show. 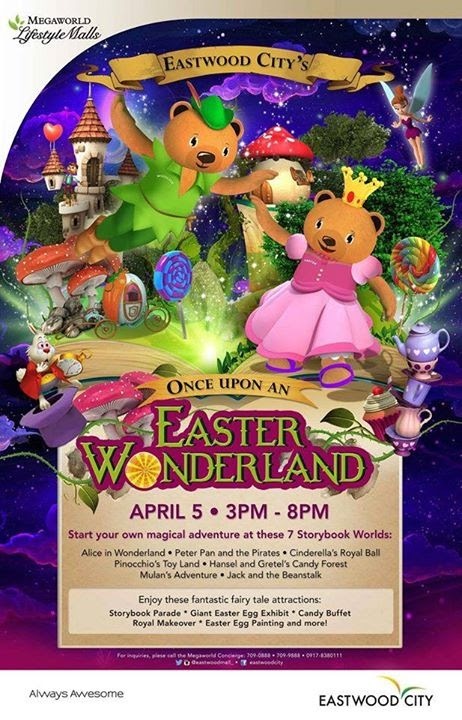 Kids in their most magical, fairytale-inspired costume will get a chance to win magnificent prizes. 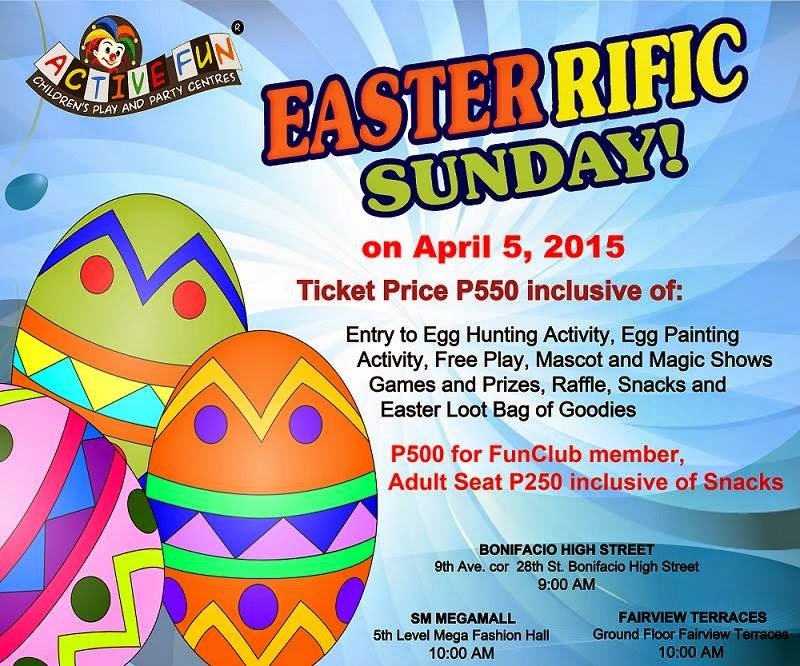 Diamond Indulgence members will get Php 100 off on the Easter Sunday event ticket price. A maximum of 4 tickets only will get a discount. For inquiries, call +63 (2) 2388840, visit their WEBSITE or like them on FACEBOOK. bag of give-aways. Brunch shall be served. 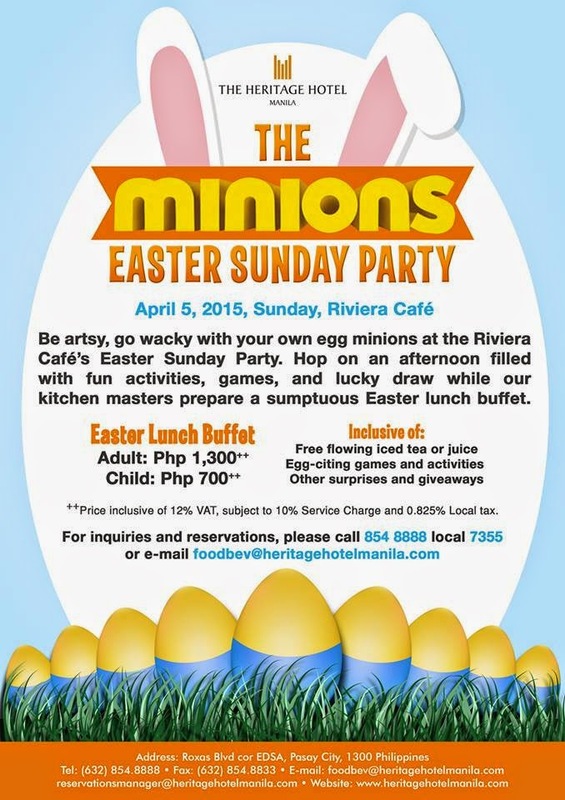 For inquiries, please call 528-5840 or email sm@centurypark.com.ph. 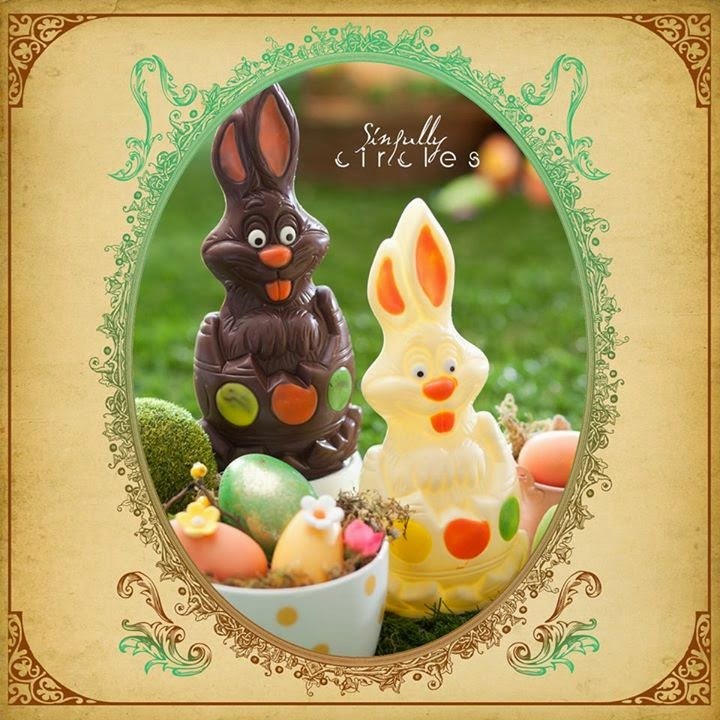 You may also like them on FACEBOOK or visit their WEBSITE for more details. 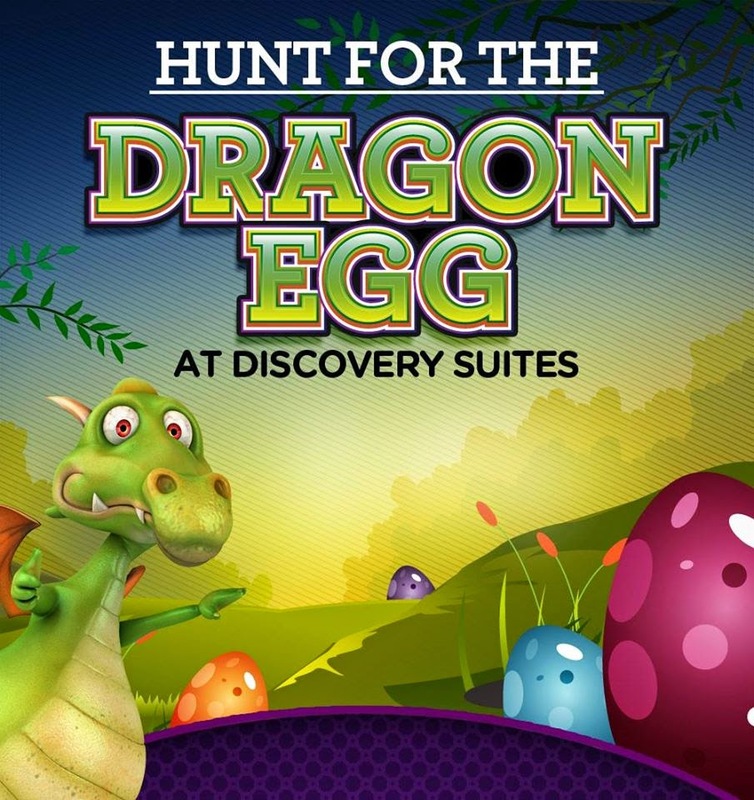 What: Delectable merienda buffet, parlor games with exciting prizes and the much-awaited Easter Egg Hunt through their Viking-inspired village that kids and kids at heart will surely enjoy. Fee: Tickets are priced at Php750 nett. Do you fancy anything on the list already? I'm sure in the coming days, there will be more to add! So make sure you come back for updates on this list! 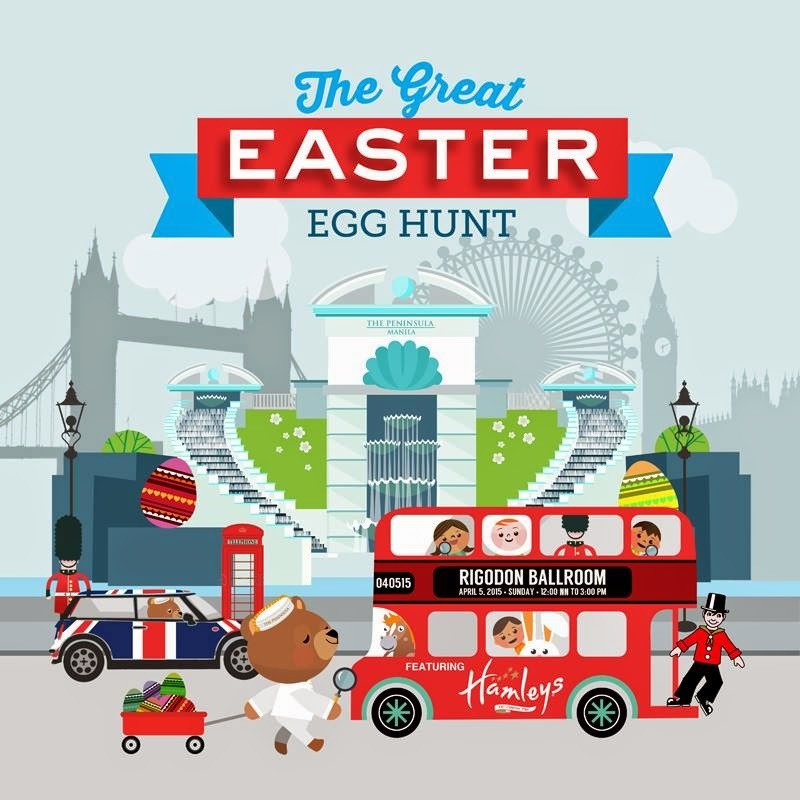 Thanks for this guide, I am looking for a Easter activity for my boys. super galing mo talaga. I look forward sa mga list mo! hi, any schedule for the malls? Thank you for sharing. 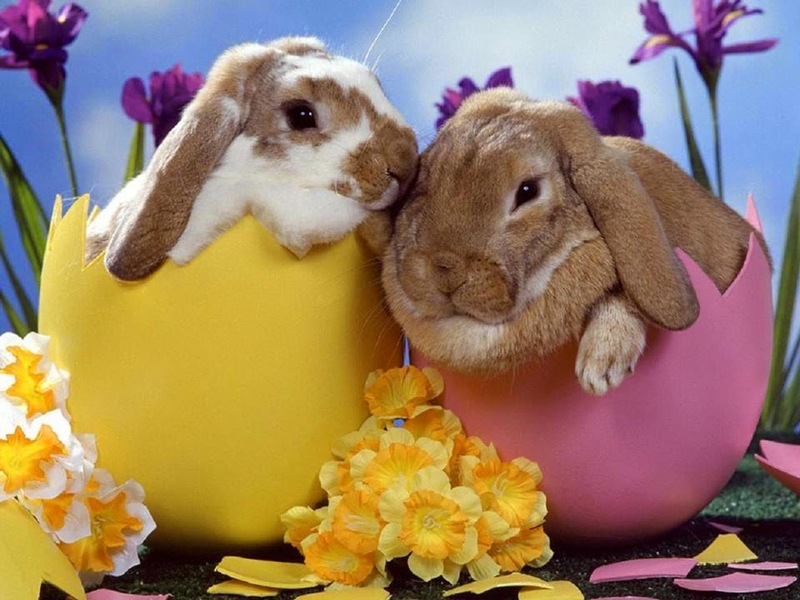 My son wants to join Easter egg hunt. Your list is very helpful.